As you move inexorably through life, you'll want to find anti-aging products that still provide a sound basis for African American skin care. Since you have darker skin, it may react differently when you compare it to lighter skin tones. There are advantages (and some disadvantages too) to having naturally black skin. The reason your skin is darker is the higher level of melanin you have in your skin. This helps to protect your skin from damage by the sun and other irritants. So, you have a stronger natural defense against the harsher rays of the sun. Sun damage can bring on a look of aging before its time, but African American skin care is also based on the fact that you may age more gracefully than people with lighter skin, and you probably won't show as many severe signs of aging. You can still use natural anti-aging products that will help you keep your skin youthful looking. The disadvantages to having black skin include their own challenges you have to cope with. Skin that is naturally dark may be more likely to develop scars that are long-lasting. When your skin is inflamed or red, it may leave dark marks after it heals. 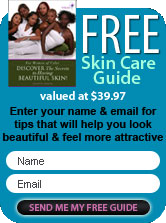 African American skin care includes natural products that will help your skin keep its elasticity longer. Otherwise, the lack of it becomes quite noticeable if you gain or lose weight over a short period of time. This sometimes results in stretch marks that may be hard to get rid of. Preventive care is very important for naturally dark skin, since the marks left after blemishes or injuries heal can be difficult to get rid of. When you are concerned with anti-aging and black skin, use products for your skin care that are nutritious. Any skin will require minerals to stay youthful, and these helpful nutrients include green tea, vitamin E and other natural ingredients. These are the skin care agents that will give you an effective and natural way to maintain clear skin. The range of products for African American skin care is quite useful in rejuvenating your skin, and it shouldn't stay a secret any longer. The proper mixtures of natural ingredients will give you unparalleled skin care, and help you to remain youthful looking. African Americans have more resistance to damage from the sun, and they can show fewer aging signs, as long as you care for your skin properly. But any imperfections you do have will be harder to deal with than they would be if you had lighter skin. Be sure you concentrate on natural preventive skin care measures against skin imperfections and signs of aging.